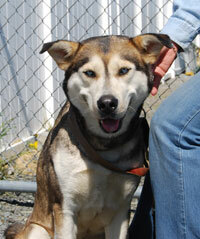 Candy is our newest addition to MaPaw and is as sweet as her name. She is a blend of brown, black and white with stunning blue eyes that nobody can resist. She is a tall girl and estimated to be one to two years old, however, she is a lady and isn’t telling her exact age. Candy is a happy girl and that constant grin is contagious and a sure way to brighten the day. Please feel free to contact us for updates, we are getting to know and enjoy this pretty little girl.